Jonathan Stroud’s ‘trilogy’, featuring the wise-cracking djinni Bartimaeus, is actually four books, counting the prequel “Solomon’s Ring”. A YA series, the books detail the development of a young boy, Nathaniel, who is taken from his parents to train as a magician in an alternate history where the British Empire continues to keep the American colonies under its thumb, and where an elite class of magicians enslave millennia-old genies and other spirits to maintain control over the population. Although the book treads popular ground in a story about a young boy training in magic, the 5,000 year-old Bartimaeus steals the show, with his quirky sense of humor and an underlying humanity his ‘human’ masters rarely show. Some classical concepts of the Jinn are used in the novel, including the concept of summoning demons and binding them to a task with magic. As always, the rewards of such an endeavor have to be balanced against the risk: Bartimaeus is quite prepared to devour his new young master if a single detail is left unattended to. Stroud also uses some of the traditional subdivisions of Jinn into ‘Afrit’ and ‘Marid’. In his story world, the Jinn exist in an ethereal alternate world where they have no form, and they are capable of taking on the appearance of animals and humans only when summoned. The concept of possession, which appears frequently in classical literature about the Jinn, isn’t employed much until the final book, “Ptolemy’s Gate”, and even there plays a minor role. The history of the ancient Middle East is delved into, with references to King Solomon, who reportedly used the power of captive Jinn to build his empire. The prequel “Solomon’s Ring’ is set entirely in this ancient world, with a feisty female assassin as Bartimaeus’s counterpart. References to the more contemporary Middle East of the novel’s setting are more limited. As in many YA works, the religious life of the characters is largely ignored, so any Islamic interpretations of the Jinn don’t play a role in the story. 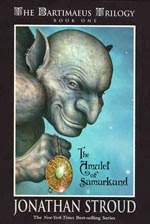 A charming and lively series, the ‘Bartimaeus’ books provide a wonderful anti-hero Jinn and an engrossing story world. Although the budding sexual urges of the young people in the novels are only hinted at, the book does contain a fair amount of violence and the final book’s resolution is far from a stereotypical happy ending. Young fans of darker fare such as ‘Divergent’ certainly won’t have an issue with it, and the series will entertain many adults as well.